A makeup artist going on-location for weddings, or a commercial shoot get to see her fair share of skin types and skin conditions. I can't tell you how many people miss the mark when it comes to properly hydrating their skin. I've put together a list of my favorite moisturizers targeting specific skin types or skin conditions. Not only does this product provide a hint of color for minimal coverage, but it's buildable in case you need more coverage. It provides UV protection with an SPF 20. It's ideal for oily, acne-prone or sensitive skin, but it can be worn by all skin types with seven shades to choose from. Product price $43.00 Available at Laura Mercier, Sephora and other fine department stores. This is a great daytime moisturizer if you have sensitive skin. Goji berry extract is a powerful antioxidant, and licorice extract relieves surface redness. Product price $37.00 Available at Murad and Sephora. This is an oil-free moisturizer that's extremely lightweight. It delivers hydration (water) to your skin, so it's left feeling smooth without any traces of residue. It doesn't clog the pores and will help alleviate redness and irritation. 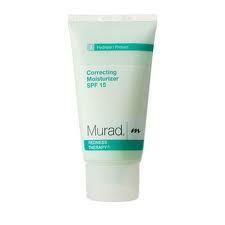 Product price $33.00 Available at Murad and Sephora. This is a lightweight moisturizer for normal or normal-combination skin. Hope in a Jar not only gives your skin a drink of water, but it also minimizes the appearance of fine lines and brings a rosy tone to an otherwise sallow skin. It gently exfoliates to provide a smooth surface; antioxidants in this moisturizer protect the skin against free radicals. Product price $28.00 - $108.00 Available at Philosophy, Sephora, and other fine department stores. This quick-absorbing cream moisturizer is lightweight due to its gel emulsification, but don't let that fool you. This effective moisturizer contains the powerful humectant Super Bio-Hyaluronic acid to help the skin retain moisture and reduce the appearance of fine lines and rough skin. Bio-EPO fights the damaging effects of free radicals. This moisturizer is a day and night treatment that's good for all skin types. Product price $71 - 90.00 Available at Shiseido, Sephora, and other fine department stores. This rich moisturizer is ideal if wrinkles and a lack of firmness are your issues, or if you want to turn back the hands of time. The Bio-Restoring Complex is a contour-recalling technology that helps to soften facial lines, retain moisture andrestore elasticity back into the skin. It's ideal for dry-skin types, anyone who likes a dewy feel, or wants to look more youthful. Product price $98.00 Available at Shiseido, Sephora, and other fine department stores. If you want to correct and improve dark spots, or improve the radiance in your skin tone without having laser treatments, this product is the ideal solution. The ingredient Viniferine is extracted from Sauvignon Blanc grapevines. It's formulated to target tyrosinese, an enzyme that regulates the production of melanin. Remember, a day cream with SPF will help prevent additional discoloration from occurring. Product price $68.00 Available at Caudalie and Sephora. *In the summer or warm months your skin will tend to produce more oil, so you'll want something with a lighter feel. *In the winter or colder months your skin is subjected to indoor heating systems and the cold outdoors, which can dehydrate the skin, so a richer texture is needed. Keep in mind it is not unusual to have two different moisturizers to meet your skins need all year round.